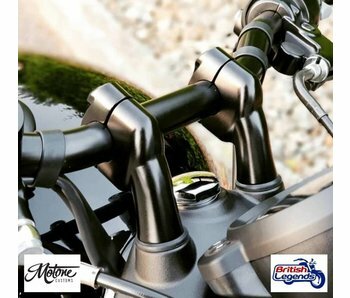 Kits to fit a Brembo brake caliper and enlarged disc s to your Triumph Speedmaster 1200, for a stronger and more progressive braking power! The FRONT kit includes two sets of calipers + pads + brackets + 340mm floating* discs to replace the original 310mm fixed discs for a stronger braking and more durability. The REAR kit includes caliper + pads + bracket + 300mm floating* disc to replace the original 255mm fixed disc for a stronger braking and more durability. * Floating discs give a high quality brake 'touch', reduced weight and better performance than a fixed disk "in one piece". Fly-screen for Triumph Speedmaster 1200 sold as a complete kit. DART brand, made in England.